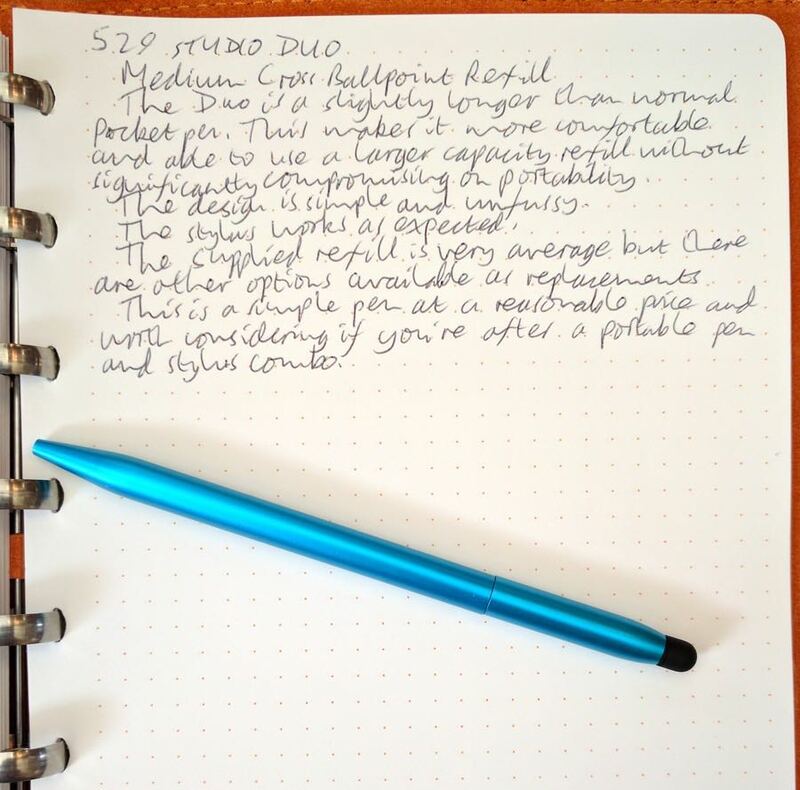 529 Duo Pocket Ballpoint Pen Review – Pens! Paper! Pencils! The 529 Duo has recently launched on Kickstarter. I was fortunate enough to be loaned a prototype to review and so here are my thoughts. First, a word about 529 Studio’s name. 529 Studio is a British-based company (in Bristol, in fact, which is just up the road from me) consisting of two designers who wanted to do something different in their spare time. So 529 is about the time when they’re not working their nine-to-five day jobs. I mention this because I think that’s such a great idea. The pen itself is assembled in the UK using parts manufactured in China. It’s a small pocket pen made from aluminium (with some brass bits inside). It’s a good size: small enough for the pocket but not so small it’s impractical. It’s comfortable enough for taking notes as you go through your day or sit in the occasional meeting but, being short and slim (unlike me), it’s not for drafting novels. The Duo name comes from it being a pen and a stylus. The stylus works as intended. The pen end uses a Cross Ballpoint refill. This is a pretty standard ballpoint which is to say it will reliably put down a line but it’s a little skippy and, for me, not a pleasant writing experience in terms of how it feels to move the tip across the paper. Cross do, though, make a hybrid ink refill that will fit: the Satnink. I’ve not tried it myself but Brian over at Office Supply Geek wrote a pretty positive review about it. 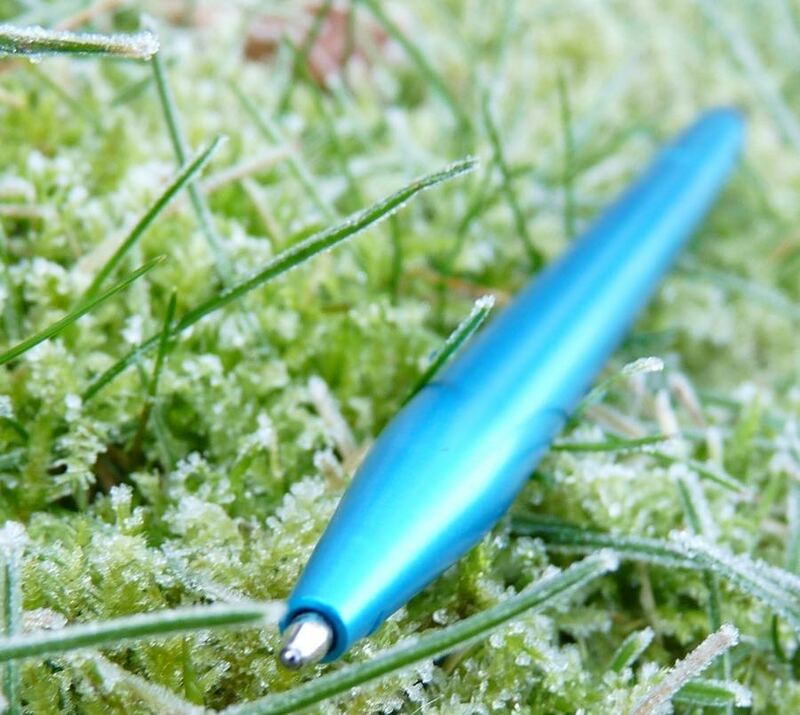 The Duo’s design is simple, a straight tube, rounded at the stylus end and conical at the pen end. The only branding is the crescent moon that is 529 Studio’s logo. The blue anodising on mine is well done. I’m not hugely into the looks of this pen myself but that is, of course, subjective. If I was picking my own, for example, I wouldn’t have picked blue. The refill is extended by twisting the top part of the pen. It’s a smooth mechanism with a feeling of quality. 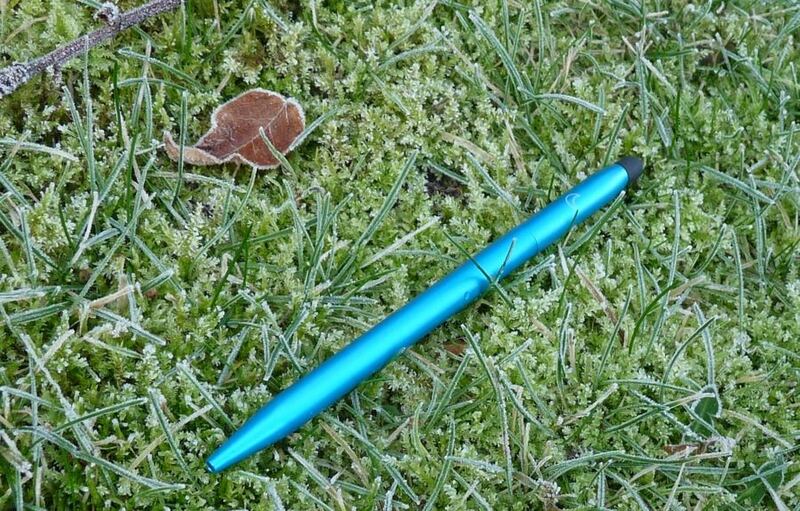 Twist is a good option for a pocket pen as there’s no cap to lose and no push button to accidentally press while the pen’s still in your pocket. The tolerances were slightly off on my pen, where the two halves of the pen come together. They don’t quite align and there’s a small gap. This is a prototype, though, and was assembled by hand. In the production pens these two halves will be assembled using a machine that aligns the parts exactly so this shouldn’t be an issue. The 529 Duo is a nice little pen at a reasonable price. Most pocket pens use D1 refills, which gives a lot of options, but there are many options with this Cross refill, too, and it’s got a larger ink capacity. 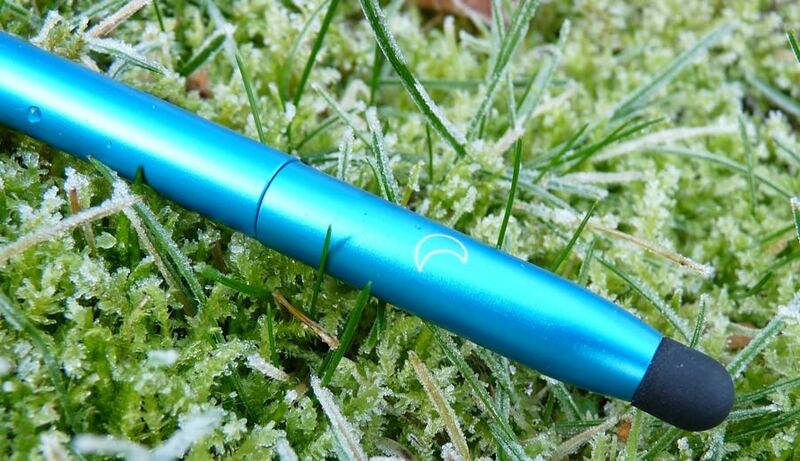 The extra length of the Duo makes it more comfortable to use without losing pocketability. 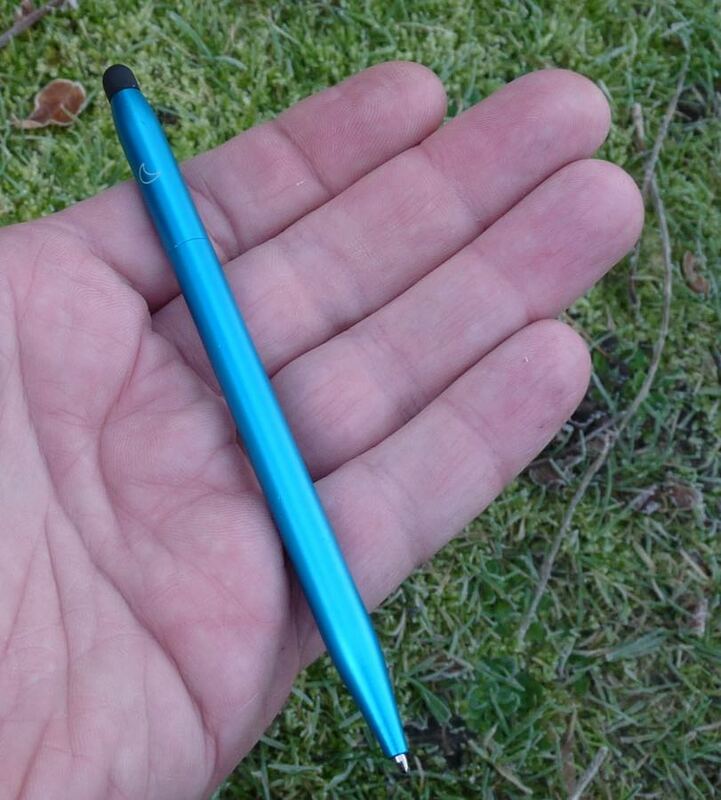 If you’re after a pocket pen with a stylus and find the majority of D1-using pocket pens too small, this is a good option. That’s a gorgeous blue! Though I’m not a fan of the design/shape. 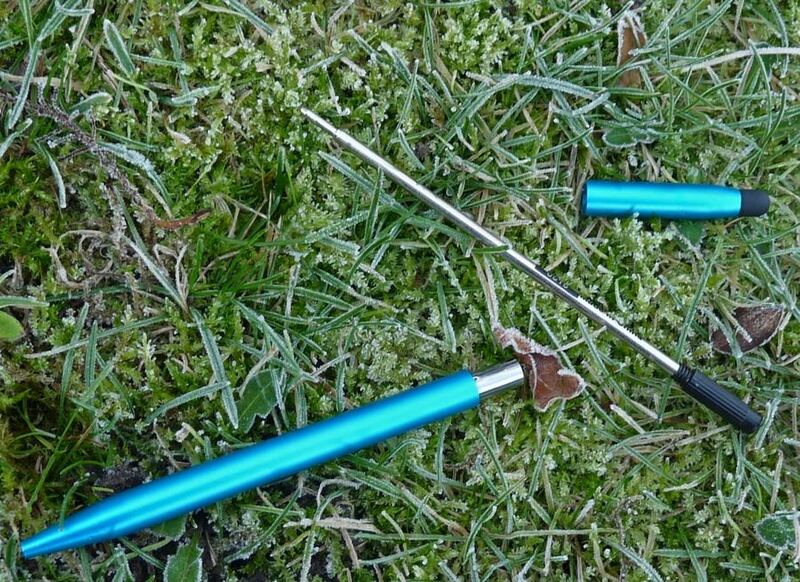 Is that frost on your grass??! You are outdoors taking photos in that kind of cold? BRRR!! Yes it was frost! Thus time of year it’s mostly too cloudy to take photos so as soon as it clears I’m out there. But with clear skies comes the frost!